These alone may be a reason to marry into a Portuguese family. 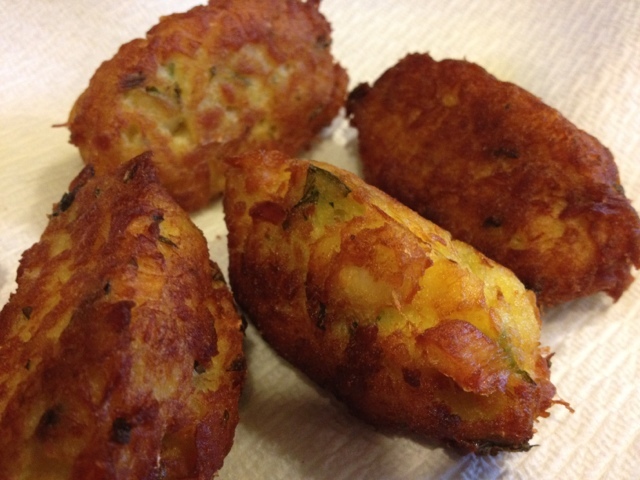 When I was first offered these “fishcakes” during a traditional Christmas Eve dinner, I had unpleasant visions of breaded and fried fish mush. Fortunately these are nothing the like. Now that I have the knack for them, I usually make them in large quantities (quintuple the recipe) and freeze the raw dough in sandwich bags for later use. My mother-in-law has one of those handy food saver systems where she actually makes the individual codfish cakes, freezes them on a cookie sheet, and then stores them in vacuum packed bags where they keep their unique shape perfectly. Rehydrate the salt cod by soaking in cold water for 1-3 days, changing the water twice daily. Many times the thin boneless, skinless salt cod pieces can take only a day whereas the thick cuts may take a full three days. If you are impatient, you can always try changing the water more frequently. I wish I could give you an exact soak time, but it depends on the thickness of the cod. Unfortunately, you just need to taste it to test the flavor: You are looking for flavorfully salty. It’s a careful balance. Although over-soaking can leave to bland yuck, remember that you can always add more salt to the recipe, but there is little that can be done with too much salt once the recipe is prepared. Once the salt cod is ready, boil it in fresh water with the potatoes until the potatoes are fork tender, which is about 30-45 minutes, depending on the size of the potatoes. Drain. Allow to cool for easier handling. Mash the potatoes. Flake the codfish by aggressively rubbing with a clean dish towel (or several towels depending on how much you cod you are using). Not only are you looking to pull the fish into flakes, but you want to rub apart the flakes into thread-like strands. 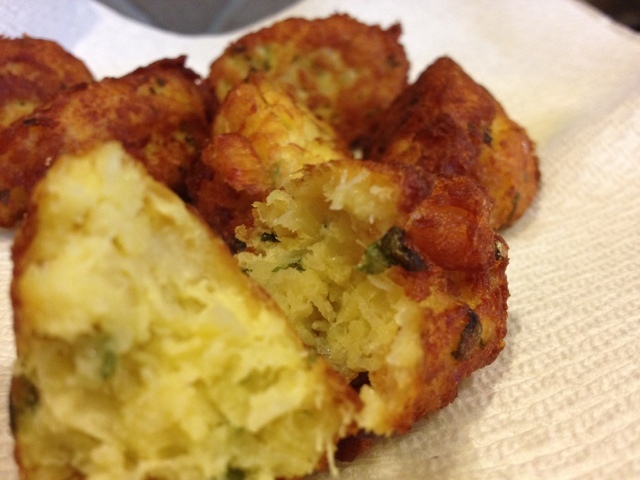 Mix the potatoes, codfish, eggs, and parsley together until a dough forms. Heat a skillet on medium. 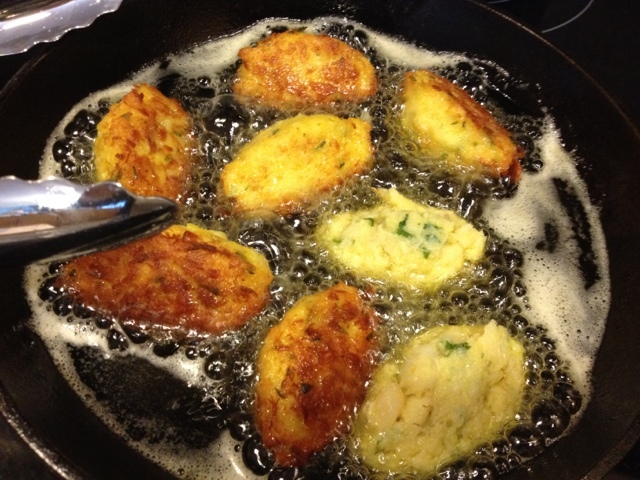 Add the olive oil enough to come up halfway on the codfish cakes, less than 1/2″. When the olive oil is hot and a test piece sizzles, it is ready. 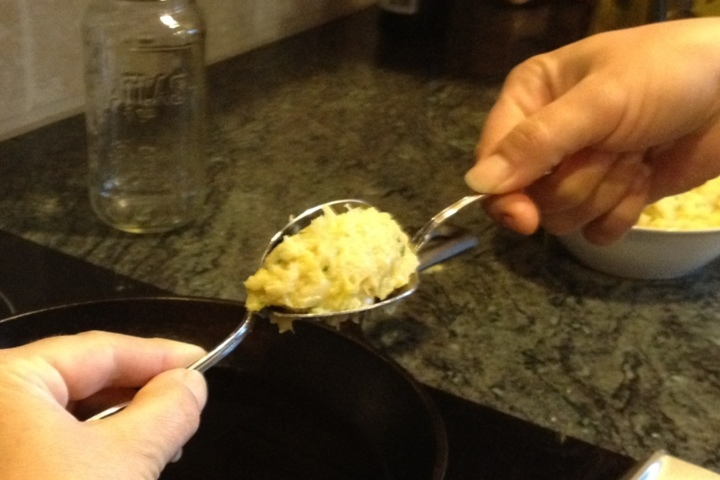 Prepare the codfish cakes in the traditional form using two soup spoons, passing the dough between the two spoons to form a three-sided mini-football shape. Fry until golden brown on each of the three sides. Drain on paper towels.